Westmead Hospital’s Department of Pharmacy staff celebrate World Pharmacist Day. 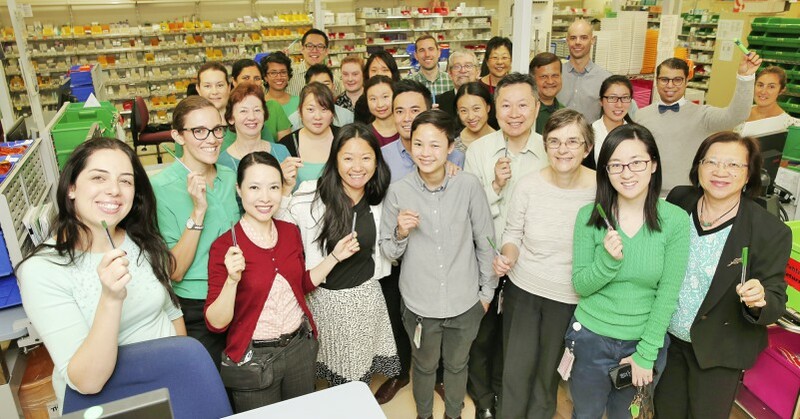 Westmead Hospital pharmacists have come together to celebrate World Pharmacist Day – and highlight the increasing complexity of their role. The pharmacy department has more 100 staff including pharmacists, technicians, aides and administrative staff who help ensure the timely, safe use of medicines for patients. It’s a big job: they cover Westmead Hospital inpatient wards, the Crown Princess Mary Cancer Center, the outpatient’s department and clinical trials service, the Centre for Addiction Medicine at Cumberland, Mt Druitt and Blacktown, and the Parramatta Sexual Health Clinic. “We provide medication reconciliation, clinical review and education for inpatients and outpatients as well as supporting and participating in multi-disciplinary education and research,” she said. “We also offer a dedicated medicines information service which is accessible to all staff at Westmead Hospital for all the increasingly complex medication questions that arise. Our Society of Hospital Pharmacists Australia chief executive Kristin Michaels today said exciting times were ahead in hospital pharmacy. “As more medicines are used by more Australians than ever before, the importance and complexity of hospital pharmacists’ work continues to grow,” she said.